We are adding the selected event(s) to your My Events page. Please be patient while we complete this process. In this special afterschool program in partnership with the Historic Ephrata Cloister, teens are welcome to meet up with the Student Historians, a teen volunteer group enthusiastic about history at the Cloister at 632 West Main Street, Ephrata. From 3:30 p.m.-5p.m., re-examine documents from the turbulent period that is known as the American Revolution and Founding Era of our nation. Homeschoolers, private and public school students are welcome to join. No admission to the historic site is required for this unique program. Together with Michael Showalter, the PHMC's Museum Educator and Rebecca Lawrence, Manager of Public & Outreach Programs at the Ephrata Public Library, we'll talk about the thorny issues that occurred during the Founding Era. 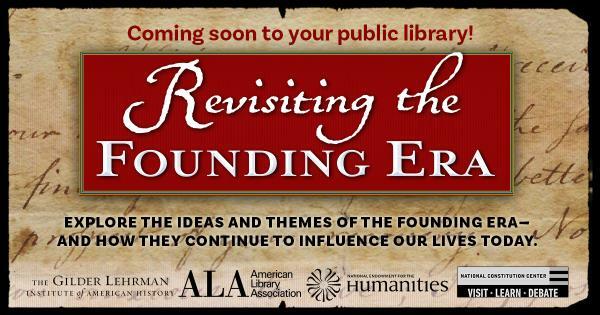 This program is part of Revisiting the Founding Era, a three-year national initiative of the Gilder Lehrman Institute of American History presented in partnership with the American Library Association and the National Constitution Center, with generous support from the National Endowment for the Humanities. Ages 13-18. Fill in at least two of the three fields below to login. Note: Before signing in, patrons must confirm their email address (if applicable).